Manyavar's 2019 wedding collection is out and here's a glimpse of it from their Dabboo Ratnani shoot! 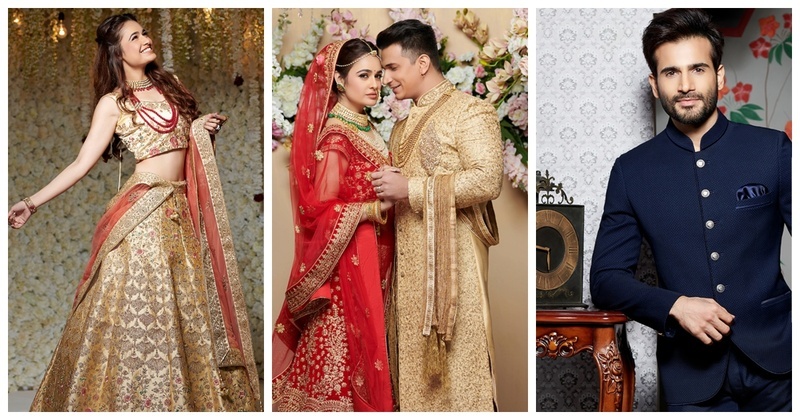 We have said this before and we’ll say it again- Manyavar is the one stop shop for wedding couture! whether you are the groom or the best man or the cousin attending the wedding, Manyavar is the place to go to! Manyavar’s wedding collection is an elegant confluence of contemporary and tradition. Once you see their 2019 shoot captured by the mastermind Dabboo Ratnani, you’ll know why are we so obsessed with Manyavar’s latest collection! The January shoot highlights their wedding collection in the classics - red and gold. Quite impressed with the pastel safa along with the pastel sherwani! The musical brothers look dapper in mint green jackets and pale golden sherwanis. This floral kurta with white dhoti pants is the perfect outfit for the mehendi ceremony! This ivory sherwani with golden motifs and golden dupatta spells only one thing- ROYAL! The June shot shows you how the groom squad could co-ordinate their outfits for the perfect photo op! The velvet fever has certainly taken over and how! Prince Narula looks dapper in this deep wine textured kurta! Another favourite classic, this red and white lehenga doesn’t fail to impress! A navy blue bandhgala for that royal portrait look! Loving this ivory lehenga with intricate work with pastel dupatta! An asymmetrical wine indo-western outfit to make heads turn! So when are you running to Manyavar, my dear?